We’ve heard and read the stories of the horrific commutes many endure to get to and from their jobs: Jourdan Duncan, the teenager in Northern California who walked for hours each day until a kind police officer bought him a bike; Stacy Calvin who spent more time commuting by bus and train than she spent at her part time job in Atlanta; and James Baker, pedaling in the snow for an hour in Frederick, Maryland, because bus service wasn’t a viable option. When you can’t afford a car and lack access to good public transit it creates a chain reaction. Not only does commuting become unbearable but quality of life drops and access to jobs diminishes, reducing economic opportunities to provide stability for your family. As the leader of a company that provides technology to transit agencies and riders, I know we can do better to connect many thousands of people like Jourdan, Stacy, and James with the public transportation they need. No one should have to endure these types of commutes. In the future they won’t have to, but there’s much work to be done to get us there. Technology can help, but it’s not enough. Upward social mobility, the ability for people and families to move up from one socio-economic level to a more prosperous level, can be facilitated by better access to jobs through public transportation. Arming transit agencies with technology solutions to better serve riders can provide meaningful benefits to lower-income people and increase their upward social mobility. It’s not a panacea. Access to transit alone will not pull even the most determined people out of poverty, but it is an important part of the solution. Inequality is a societal problem, and it will take society’s resolve and effort to make change happen. In a large continuing study, research has borne out that areas of the country with lower commute times have higher social mobility, but decades of development have created patterns of urban sprawl and city centers that are increasingly difficult to serve efficiently with public transportation. As a result, employment, education and healthcare are out of reach for many low-income families. How can we, as a society, help people and families find their way out of poverty and into a better life? After all, isn’t that the American dream? I strongly believe that technology, along with the use of research and data can and (dare I say) will bridge the gaps among governments, public transit agencies, private businesses, non-profit organizations, and individuals to provide better access to jobs and other services. Although I’m focusing here primarily on lower-income people reaching for upward social mobility, I recognize this is a complex and multifaceted problem that involves and affects all of us. 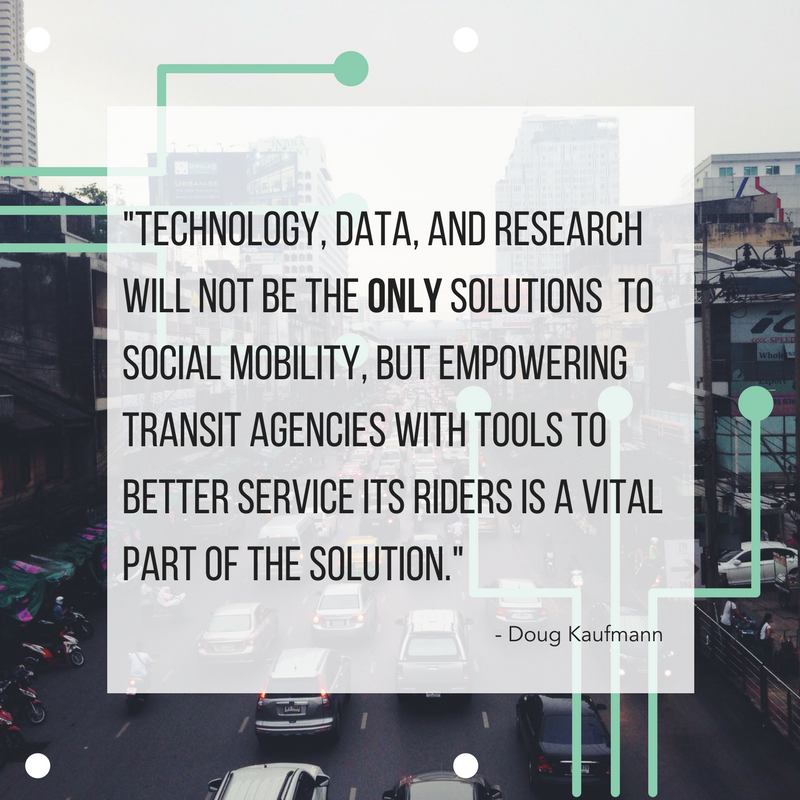 Technology, data, and research will not be the only solutions to social mobility, but empowering transit agencies with tools to better serve its riders is a vital part of the solution. Home values performed 42% better on average if they were located near public transportation with high-frequency service. The old adage that it takes a village is true. Only through cooperation between private and public sectors and from grassroots efforts up through federal level actions can true change come about. The pieces are there, but coalitions must form to drive us forward. 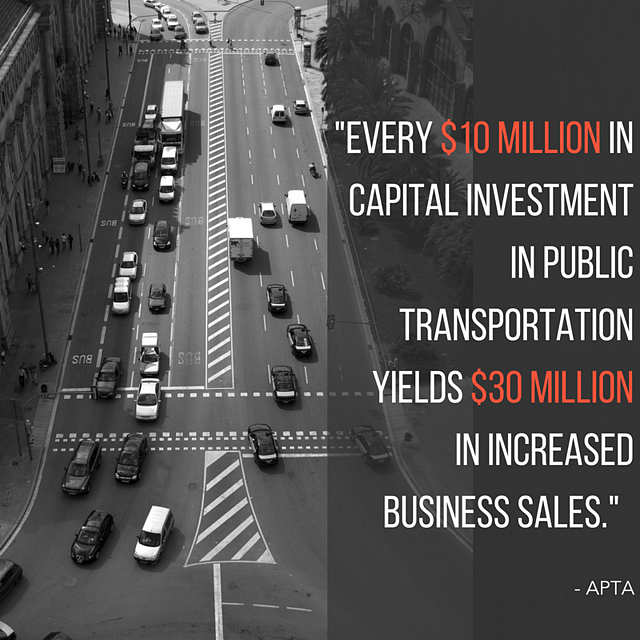 Investment in transportation is good for the economy and for people. Empowering transit agencies with better data and technology will provide them with the ability to make better use of their assets, provide a better experience for their riders, and enable agencies to get more folks where they need to be in less time with less hassle. What can you do? First, start small. Look for public transit options in your community. Maybe they’re terrible, but maybe they’re better than you expect. Rather than diving right into the deep end, try taking a trip once a week via public transportation, and see what it’s like. You may find that you enjoy the extra time to read, listen to music or a podcast, get some work done, or even become inspired to get involved in a more meaningful way. If you do decide to get involved in more meaningful ways, I recommend the local level. Local jurisdictions are able to make change more rapidly than federal agencies, and individuals can have a greater impact at the local level. As Rosabeth Moss Kanter points out in her book Move: How to Rebuild and Reinvent America’s Infrastructure, Community advocates believe that there should be a choice: get organized and demand better. Get away from the NIMBY (Not In My Backyard) mindset. Only when we’re open to change can change happen. Vote on referendums that support worthwhile transit initiatives. One of the reasons I joined my company, TransLoc Inc., in 2012, was to be at least part of the solution to this huge and complex problem. Together, we can change the world and help improve the lives of millions. Sabrena LLoyd, who cannot afford a car, spends five hours a day, six days a week, getting to and from her job in Tampa. There’s simply no reason for this to be the case. We have the data. We have the research. We have the technology. 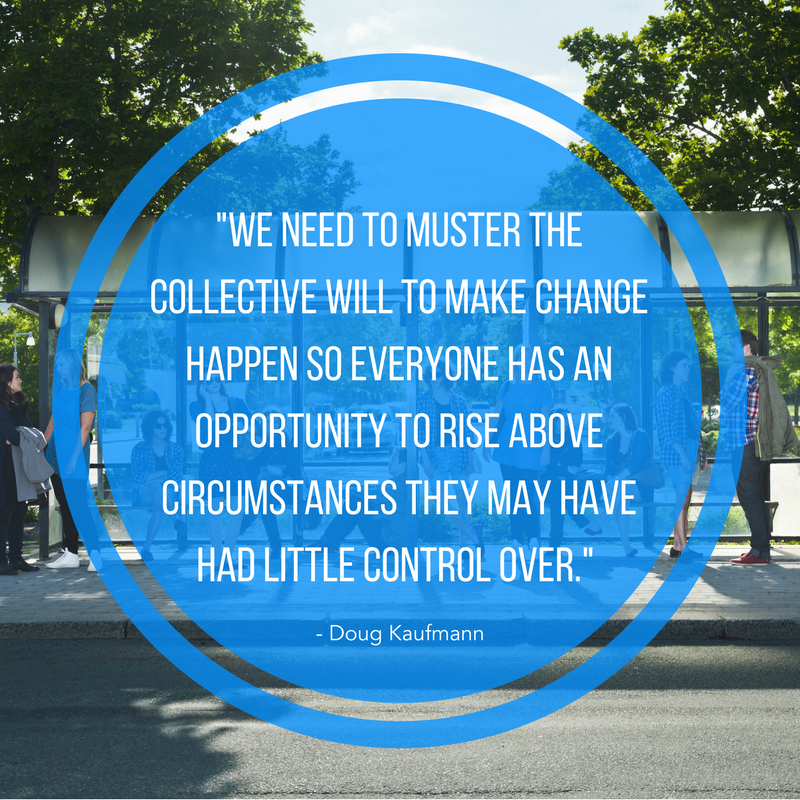 We need to muster the collective will to make change happen so everyone has an opportunity to rise above circumstances they may have had little control over. Vibrant and innovative public transportation is good for all communities and all people, not just the poor, and it’s our tax dollars working for the good of everybody. But in the end, it takes people with the conviction to help each other.